You’d be foolish to take away too much from how a rookie plays in NBA Summer League. Sometimes future stars like Damian Lillard can announce themselves with huge Summer League performances, but for every Lillard there are a dozen Donte Greenes who show out on the small stage then quickly fade away once the real basketball starts. 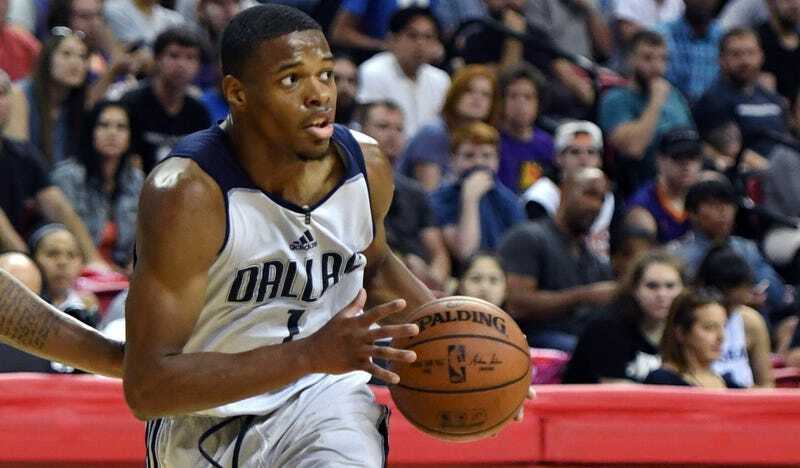 All of which is to say, Mavericks rookie Dennis Smith Jr. might not be a future mega-star, but good lord, he at least looks like he’ll be fun as hell to watch. The Mavs had the ninth pick in the draft, which meant they were at the back end of an agreed-upon second tier. Prognosticators identified a strong gap between the Frank Ntilikina-Lauri Markkanen-Smith Jr. cohort and the Malik Monk-Zach Collins group, and all the Mavs had to do was wait for whichever prospect fell to them. They have have lucked into the most explosive player in the top 10. Smith Jr. made his bones in college by overwhelming lesser opponents with his athleticism, and it seems that his bounce and burst will seamlessly translate to the big leagues. So far in Las Vegas, he’s putting up 20 points, 6.3 boards, and 4.3 assists per game in 27 minutes. That’s fine! Great, even. But the raw numbers aren’t as impressive as his ability to penetrate through the defense get to the interior with ease. He’s already got a nose for finishing around the hoop. A missed dunk was his best highlight (perhaps the best highlight) of Summer League. It’s only a matter of time before he humiliates someone in the NBA with a huge dunk. Mavs coach Rick Carlisle is notoriously rookie-averse, but hopefully he realizes what a game breaker he has in Smith Jr. and lets him cook.